Yesterday, I decided to pull out of the VizThink 2008 conference, for reasons that I will explain. Because I have been advertising my involvement in the conference on this site and previously suggested that you consider attending it in this blog, I want to explain why I’ve changed my mind about participating. When I was first approached by the VizThink team and asked to speak at their inaugural conference, back when only two or three others were on the list of speakers, I was excited about the conference’s potential. As a specialist in data visualization, I recognized the value of bringing together experts from all visual thinking disciplines. There is much that we can learn from one another. As the list of speakers continued to grow, however, my hopes began to wane and my concerns mounted. Don’t get me wrong! The speakers are experts in their fields. My concern is that as a whole they don’t accurately represent the spectrum of visual thinking, and that the list of topics is heavily skewed, primarily toward the use of drawings to record ideas (such as during a brainstorming meeting) or in printed form to explain something, such as a concept or process. Until yesterday, out of 38 speakers and 32 breakout sessions, I was the only representative of “information visualization”—and now there are none. This mix misrepresents visual thinking as primarily related to various forms and uses of drawings. As such, it fails to feature what I believe is the most exciting way in which visual thinking is supported by technology today: information visualization—”the use of computer-supported interactive visual representations of abstract data to amplify cognition” (Card, Mackinlay, and Shneiderman, Information Visualization: Using Vision to Think, 1999). I don’t mean to disparage the use of drawings to help people think about ideas and communicate them to others, including those that take the form of comics (10% of the sessions feature this aspect). I just think that this emphasis on drawings gives a lopsided impression of visual thinking, which is not the impression that an inaugural conference on the exciting and important topic of visual thinking should promote. Besides this imbalance, one other concern also discouraged my participation. I suspect that many of the visualizations that will be featured at the conference fall into the realm of what I consider ineffective. Drawings are fun and entertaining, and when appropriately used and properly designed, they can support thinking in meaningful ways. When they are used gratuitously or improperly designed, however, they can undermine thinking. I believe that this conference should be about effective visual thinking. To meet this standard, this conference should promote the use of visualization only when visuals are the best way to get the message across, and it should feature visual designs that are firmly rooted in an understanding of visual perception and cognition. 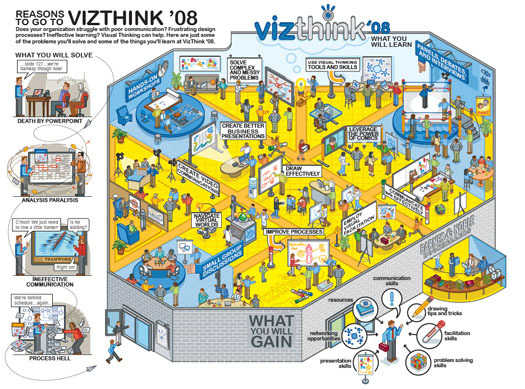 If the poster below, which was designed and is being used to promote VizThink 2008, represents the view of visual thinking that will be featured, I am inclined to question its merits. I don’t believe that this an effective way to help people consider the content and decide if they should attend the conference. This poster strikes me as no more effective for visual thinking than a set of PowerPoint slides filled with bullet points is effective for communication. When I see a picture like this, I’m discouraged from looking at it by the visual clutter. I have to work much too hard to glean what’s meaningful from the chaos of visual content. To the degree that VizThink 2008 ends up teaching people to use visualization in this way, it will do a poor job, both of serving their needs and of representing the potential of visual thinking. I realize that by expressing this opinion, I am opening a can of worms and inviting debate. I’m doing so intentionally, because discussion could be helpful. I know that my concerns are shared by others who have nevertheless chosen to speak at the conference, hoping to nudge it in the right direction. Again, let me clarify that I am not questioning the potential benefits of visualization media of many types as aids to thinking. What I’m arguing is that we need to approach visual thinking critically, test our methods for effectiveness carefully and responsibly, and make sure that they conform to what we already know about visual perception and cognition based on years of established research. Visual thinking is an important topic that has much to offer the world. For this reason, I wish VizThink well and hope that, given time, it evolves into a conference that provides a balanced view of visual thinking, promotes only those practices that are effective, and builds a strong multidisciplinary community of practitioners. If and when it does, perhaps I will be invited again to participate and will be able to accept the invitation with enthusiasm and without compromise. I think you’re being a bit too pragmatic (and impatient) about this. Sure, the conference may not be about visualization, but that is exactly why people like you are so important there: you bring something to the table that is totally different than the rest. And you are the one to push the priorities of the conference in the right direction. It’s a new conference after all, it will need a few years to find its niche and purpose. And the people going there might realize the potential of technology when shown the right tools. I have attended a few workshops that were outside of InfoVis, and I have learned a great deal from them. Especially at the last Image and Meaning workshop, I saw how visualization knowledge can really be helpful when thinking about some of the problems presented there. It’s also great to see people do very hands-on stuff, which is very different from the way we usually do things with computers. Your design space is a totally different one when you’re working with pipe cleaners, post-its, and string. Sure, it’s not all 100% useful, but it broadens your horizons. So I think you should reconsider your decision. You’ll learn much more from such a meeting than you might expect. I appreciate your perspective. I would have hung in there with the VizThink conference had I been granted the opportunity in a general session to broaden the spectrum of visual thinking that’s being featured and advocate a critical evaluation of the visual thinking techniques. In response to a request from the VizThink CEO to all speakers for general session content suggestions, I proposed that they give me a portion of a session to speak on the topic “Not every picture is worth a thousand words.” I explained that my purpose would be to give attendees as a whole some exposure to information visualization and to argue that visual thinking should be rooted in an understanding of visual perception and cognition, derived from scientific research. In response from the CEO, I was told that I could only address this topic in a general session if I were willing to do so in the form of a debate with one or more other speakers. He explained that he had already decided that no general sessions would include anything similar to a traditional keynote address. I found this explanation inconsistent, however, with the fact that the final general session will feature a single speaker, Tom Wujec, of Autodesk, one of the two premier financial sponsors of the conference. Regardless of this inconsistency, I believe that the general sessions should provide the content that the attendees most need, presented in the best way possible; not blindly adhere to a policy that the general sessions must be entirely unlike those of other conferences. Such a policy, while good intentioned, becomes a barrier to the goals of the conference when written in stone. The topic that I proposed, because the conference needs to hear it, would not come across as clearly nor compellingly if the brief time allocated were fractured into the back-and-forth, shoot-from-the-hip form of a debate. I care too much about the quality of communication to compromise on this. We’re sorry you won’t be joining us at VizThink. Our goal is to create a diverse and inclusive community. We would have loved to have more information visualization people on the schedule, but as a young community (only a few months old), our network into that community was very limited. Your participation would have been a great step in that direction. You will most certainly be missed. I do feel that your last comment requires more explanation for your readers as it implies that we are acting unethically or at least unfairly. We decided long before we started the conference or invited anyone to be involved, that we would have facilitators rather than speakers or keynotes. That is more than just semantics in our design. We’ve all been frustrated with the traditional conference model and how little value it provides to the attendees. We’re determined to break that model, and as part of that process we’re doing things very differently than many are used to including many experiments. That includes over half our breakout sessions being hands on activities for people to begin to practice key ideas rather than just listening to experts talk about them (which, by the way, is based on solid learning theory). Our general sessions are continuing that philosophy with no keynotes or solo presentations. We’re doing a variety of hands on activities, interviews, panels, and hopefully even a debate or two (which I find to be amazing learning opportunities). While Tom Wujec is from one of the sponsoring companies, his segment (only 30 of the 90 minute session) will be displaying new visualization technology from other companies bringing many of them like IBM and E-S3 up on stage with him. That doesn’t sound like either a keynote or a sponsor session to me. If you know Tom, he’s brilliant and completely in touch with all of the technology advancements in visual thinking. I can’t think of a better person to facilitate that session, and am happy he agreed to do it at my request. We will miss the diversity that you would have brought. We certainly want to include all portions of the visual thinking community and hope that you and others from the information visualization community will join us in the goal to unite and promote the community as a whole and all of it’s diversity. We definitely need the help of the community to help us get there. If you or your readers are interested in helping us, we would certainly welcome the support both now and in the future. The information visualization research community is rather large and growing. I’m fairly sure there are at least as many infovis folks as the number of folks who teach people how to think through the use of drawings. I believe that you have primarily recruited those who use drawing as a means to support visual thinking because the person who gave birth to the conference, Dave Gray of xPlane, is an expert in this particular arena. This is understandable, but a problem nevertheless. The result is an imbalanced representation of visual thinking, which I hope will be corrected in the future. Regarding your decision to avoid anything resembling a traditional keynote presentation, this is something that you failed to mention when you invited me to participate. In fact, you failed to mention this when I asked early on if you wanted me to speak in a general session or only in a breakout session. At the time you answered, “My guess right now is that we’ll probably use you as a 20-minute keynote with a 90-minute breakout.” You even used the word “keynote” to describe one of the ways that I would probably be asked to participate. My proposal for a general session precisely matched what you said I would probably be asked to provide. The discussion that I’m hoping to foster in this blog concerns the nature of visual thinking and what should be done to promote effective practices. The inaugural VizThink conference has already been planned, and little can be done now to correct the imbalance that exists. My current concern is “What can we do to promote the full spectrum of effective visual thinking, either through VizThink in the future or through any other means? 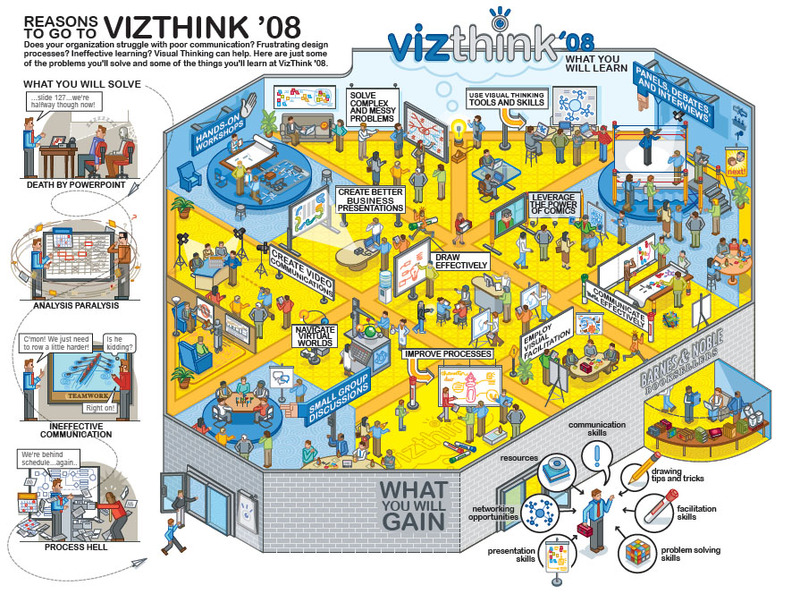 I hope that the concerns that I’ve raised about the quality of visual thinking practices—what works and what doesn’t—will plant a seed in the minds of at least some of those who attend VizThink 2008 to evaluate the merits of what they see. Not every picture is worth a thousand words. Given the fact that you once gave a presentation titled “Using Xcelsius to teach business literacy” (DevCon, August 2005), I’m not surprised. btw, you were right about Xcelsius: I had high hopes but nobody is using it…. I don’t feel that your interest in VizThink 2008 is a problem. Good friends of mine and others whose work I respect as well will be speaking at the conference. The concerns that I’ve raised are that (1) visual thinking is not being represented in a balanced manner (in my opinion, the best is missing), and (2) the effectiveness of some work that will be featured as aids to visual thinking might be questionable. Regarding Robert’s comments, don’t read anything into them that he hasn’t explicitly stated. Robert is a friend and colleague who teaches information visualization at the University of North Carolina at Charlotte (UNCC). Even though Robert might have chosen to stick with the conference had he been in my position, I suspect that he shares my concerns. And finally, regarding your favorable opinion of the VizThink 2008 poster, I’m sure that many people would look at it and feel the same. The question isn’t whether or not you like it, but does it work as an aid to thinking. I believe that a different approach would have better served the purpose. If you disagree, it would help if you explained how and why you think the poster works and why you believe it achieves the goal in the best possible way. I don’t know any of you (I am just lucky that way). Robert made two points that I just reflexively agree with: one, it’s a new conference (i.e., how many inaugural conferences happen to settle on their optimal configuration? mistakes will be made…) and two, the more important & delicious idea (the only this so far on this page worth savoring), that learning comes from unexpected and strange places. I think I understand your concerns. But the first (#1) is a springboard for your presentation [which, btw, you are well suited for] and the second (#2) is par for the course. Why must the conference, strictly speaking, be effective? Do you care that much, isn’t success getting your message out? I would rather wish for a conference, here is my criteria, that is well-attended and engaging. Aren’t conferences just idea mashups? – No particular element is a focus, no overriding point. While a violation in some cases, good here because it conveys a sense of the ‘all you can eat’ buffet, a buffet of techniques and technologies. – Barnes & Noble attached. How did you know I am bookish! – “Leverage the Power of Comics” – this sells me immediately. Dying to learn about Comics; I distrust anyone who doesn’t think comics are instructive. – Is clever; see boxing ring, cute! VizThink is a brand new conference, and as such, it cannot be expected to get everything right the first time. Rather than a product of design, however, which a conference on visual thinking should clearly exemplify, the conference looks more like the product of randomness, whim, and questionable influence. I wish that the full spectrum of visual thinking had been more carefully considered and a greater effort had been made to secure broader representation and a balance among the speakers that better corresponds to the population of visual thinking professionals. For me, conferences are not just “idea mashups.” It is certainly true that any conference will provide an opportunity to learn through interaction with others who attend, even one that is horribly organized and lacks any worthwhile speakers (which is certainly not true of VizThink). My work gives me many opportunities to attend conferences, however, so I’m not desperate for another chance to mingle. I could certainly learn from the other speakers and from those who attend, which I regret. Because my time is limited, however, I am forced every day to choose some things over others. I withdrew from this conference in part because the opportunity to speak to a small group of people in a breakout session only and not to the conference as a whole as well, reduced my contribution to a level that does not justify the time and effort. Having withdrawn, I’ll now be able to invest the time that has been freed up in the book that I’m writing on visual analysis, which I believe will reach more people and in a more meaningful way. You have described why you find the VizThink poster engaging—why you like it—but not how it demonstrates support for visual thinking. If the poster’s purpose were to get you in particular to attend the conference, it has perhaps done its job. Will you attend? If its purpose were instead to demonstrate an effective visual thinking display, however, I would put it in the category of Xcelsius’ dashboard gauges: eye-catching and cute, but not effective. …otherwise, thanks for your candor. I’m being sort of playful as an outsider but your argument makes sense. You do make me think: I do like the poster in the way that I first liked Xcelsius dashboards. I thought Xcelsius would be huge but, it is now clear that, once the novelty wears off, it does not get much traction from users (quite aside from, or before, design principles). Cheers! Xcelsius is becoming huge at my company (25,000+ employees). You’ve just got to know how to best make use of it. I am quite familiar with Xcelsius. Compared to other products that are available, it is very poor, both for dashboard displays and data analysis. If you’re interested, you might want to search this blog and my articles for those times that I reviewed Xcelsius. Unfortunately, Xcelsius has sold quite well, because of an enormous amount of advertising and the superficial appeal of its graphics. It is not capable, however, of producing the effective visual designs and analytical functionality that I advocate.